That’s me! 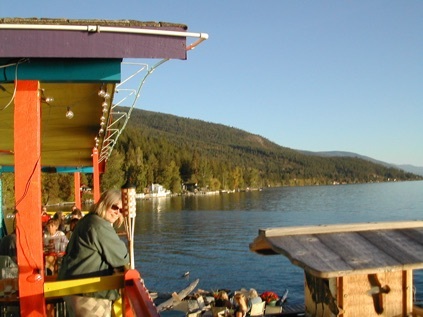 at the Raven in Woods Bay, checking out the gorgeous Flathead Lake view. I appreciate knowing if you encounter any difficulty with any of the links on my site (email me!). Today, Sept 2, 2016, after three years, I finally finished moving all my Cat’s Kitchen recipes to the new blog (catsfork.com/CatsKitchen). Please explore! I continue to add more recipes to the new site. Blog: Over the next several months, I will be moving my health articles to a wordpress blog. I’ll track progress here. Moving to new blog format. My Site Map (General Menu) has moved. Copyright Protection: All photos and stories on this website are protected by copyright. Book: Vibrational Medicine: The #1 Handbook of Subtle-Energy Therapies 3rd Edition, By Dr. Richard Gerber, MD discusses radionics, etc. Use “cmhaug4 (at) earthlink (dot) net” if you wish to communicate with me (address disguised for security). 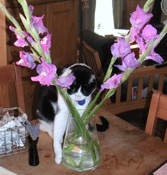 Photo, above: Charlie-Cat trying to get water out of the gladiolus vase (090811). Click on the photo for more Charlie photos.